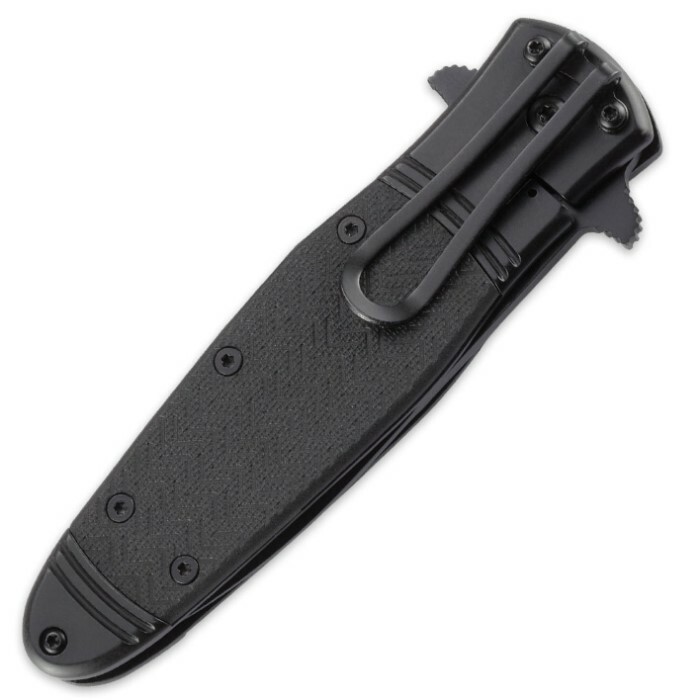 CRKT Bombastic Pocket Knife | Triple Point Serrations | IKBS Ball Bearing Pivot System | Black | BUDK.com - Knives & Swords At The Lowest Prices! 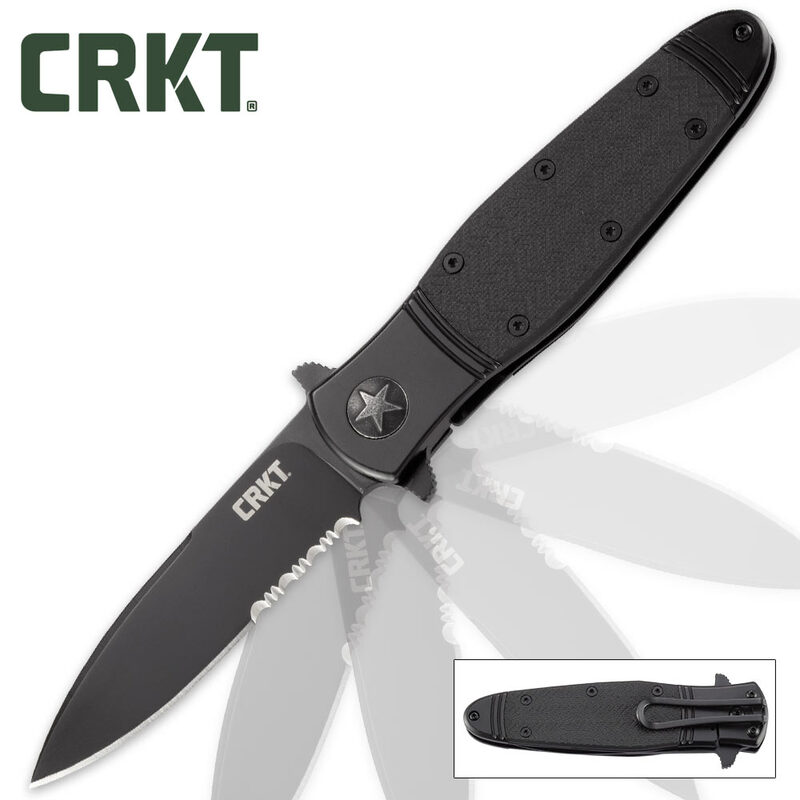 With its old-school look and dependability, the CRKT Bombastic Pocket Knife is not the type to let bygones be bygones. Classic vintage styling. Textures and contrast from World War II. The Bombastic certainly isn’t your average everyday carry folder; it’s a show-stopping instant classic with ahead-of-the-curve capability. World-class designer Ken Onion has turned out countless award-winning designs in his Kaneohe, Hawaii shop, and the exquisitely engineered Bombastic is bound to join the ranks. The sleek spear point blade features CRKT's exclusive, ultra-savage triple point serrations, one false edge, a discreet black oxide finish and a retro dual hilt. One-handed opening is swift and smooth, thanks to CRKT's advanced IKBS ball bearing pivot system, and the blade guard at the top of the handle adds an additional layer of safety and style. But the real head-turner is in the Bombastic's cool handle shape and design. Reminiscent of classic WWII-era bomber planes, it's made of black glass-reinforced nylon with a chevron-textured inlay, smartly offset with slick black stainless steel bolsters. The handle mimics old-school military equipment with a museum-worthy level of authenticity, and an iconic "one-star" over the pivot bearing affords a vintage finishing touch. When classic military style meets a technically capable everyday carry design, you’ve got yourself one serious showpiece. But this showpiece isn't just for "show," as the CRKT Bombastic Pocket Knife performs equally well in both the field and display case.